Productivity, and the reasons why some countries are more productive than others is an issue of long-standing interest to economists. Cross-country differences in productivity are pondered over and worried about in the policy circles of most countries, including New Zealand. A new column at VoxEU.og, by Nezih Guner, Andrii Parkhomenko and Gustavo Ventura, attempts to dig a little deeper in to the issue, looking into differing managerial quality between different nations. 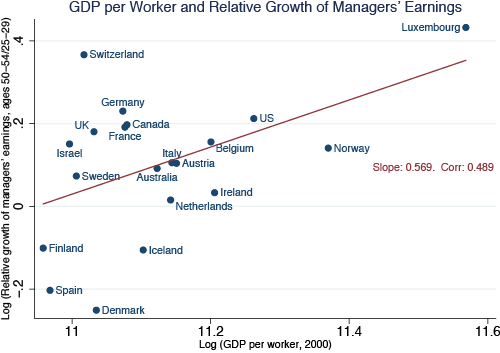 In high-income countries, the mean earnings of managers tend to grow faster than for non-managers and the earnings growth of managers relative to non-managers corresponds to output per worker. To understand why countries like Italy (and New Zealand?) lag behind the US in terms of output per worker, they argue we should take into account that there are more incentives to invest in managerial skills in the US. [...] we contend that in order to understand why countries like Italy and others lag behind the US in terms of output per worker, we should take into account that in the US, the incentives to invest in managerial skills are not as distorted. A young person who contemplates a managerial career takes into account distortions (regulations and other factors that act as implicit size-dependent taxes) that he or she will face when earning a higher compensation as a manager. In economies with larger distortions, individuals will either invest less in their managerial skills or choose a non-managerial career. In equilibrium, these reactions lead to lower managerial quality and output per worker, and to lower earnings growth of managers relative to non-managers, as the data indicates.